(ARA) – No other flower can evoke romance in the garden like a rose. As America’s favorite flower, roses can be found adorning homes in quaint coastal villages to rural farmlands, modern cities to quiet mountain retreats. “Anybody can grow roses, no matter where they live. If you can grow grass, you can grow roses in your landscape,” says James A. Baggett, editor of Country Gardens Magazine. Whether it’s a prize-winning hybrid tea rose you’re after, the rich colors of shrub roses sprinkled throughout your landscape or containers full of blooms on your deck or patio, with a little know-how, you’ll grow roses that are healthy and beautiful and that you can show off with pride. It can happen to anyone. Even experienced rose enthusiasts have lost a favorite rose to stressors like powdery mildew, drought, or extreme summer heat. Now science has come to the rescue to give your plants the fitness edge they need to keep healthy and strong – no matter what unpredictable heat spell, cold snap or disease should hit. Whether you’re a beginner or a seasoned rose gardener, you can enjoy success with a good plant-strengthening spray like Jaz Rose Spray, new this spring. This easy-to use, safe and biodegradable leaf spray was developed by plant scientists and endorsed by the American Rose Society. Jaz Rose Spray (www.jazsprays.com) contains jasmonate, which naturally occurs in plants and helps to keep all roses strong and resistant to disease, pests, excessive heat, drought, cold and salt. It works by boosting your plant’s natural resistance to environmental stressors and encouraging vigorous roots, growth and blooms. Renowned landscape designer Jon Carloftis plants shrub roses in containers. “I like to give them perfect planting conditions such as good drainage, rich soil and the addition of regular fertilizer that won’t be an overdose to neighboring plants,” he says. * Sunlight: Provide your roses with direct sunlight for at least five to six hours each day. * Soil: Roses grow best in good soil with a pH ranging from 6.5 to 6.8. Till to a depth of two feet – adding a good organic compost or peat moss for healthy drainage. * Location: Don’t plant roses too close to shrubs or trees that will compete for water, light and nutrients. Provide them with adequate space for air circulation. * Water: It’s best to water rose bushes twice a week, thoroughly at the base of the plant. 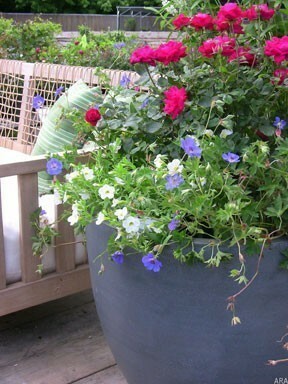 Avoid late-evening watering that can foster powdery mildew. Instead, water early in the morning to allow the leaves to dry before nightfall. * Fertilize: Fertilize roses every one to two months starting in the spring with balanced fertilizers containing nitrogen, phosphorus and potassium. Stop fertilizing in late summer or early fall to prepare them for dormancy. * Drainage: Whether you grow them in containers or the ground, good drainage is necessary to prevent water from pooling at the roots. Improve drainage with tilling or raised beds and containers with drainage holes. So grab a shovel and get digging in the dirt and get set to enjoy beautiful roses. To learn more about rose care from the experts and Jaz Rose Spray, visit www.jazsprays.com. That’s a difficult question to answer, not knowing anything about the health of your plant nor the conditions in which it is growing. Is is a young plant? Is it in fertile soil? Light? Water? Perhaps you could give us a few more details? I love planting roses in my garden.I have different roses in my home garden but I don’t know what is the right way to taking care of them..Your post is very beneficial to me,,thanks for sharing…More power.. Thanks for the fine tips. I’ll try a few of these. I love growing roses. Someone many years ago told me roses don’t grow in FL. I’m glad I did not listen to him. I have lost a few, but that hasn’t stopped me. I love the old garden roses and they do very well down here. Very helpful information in this article.